Pope Benedict XVI embarks on his first of five Apostolic Voyages for 2010 this weekend. Before he heads to Portugal, Cyprus, Britain, and Spain, he starts it all off with Malta. The visit will celebrate the 1,950th anniversary of St. Paul's shipwreck on the island that, according to tradition, occurred in the year 60 A.D., during the Apostle's second voyage toward Rome. Our Salt + Light Television coverage begins on Saturday, April 17th at 11:00am ET as the Holy Father touches down at the International Airport of Malta in Luqa. Also on Saturday, the Pontiff will visit with the country's President and the Cave of St. Paul. On Sunday, live at 4:00am ET, the Holy Father will celebrate Holy Mass at the Floriana Granaries, followed by the recitation of the Regina Caeli. Before he departs on Sunday, he will also visit with young people at the Great Port of Valletta. For details on the itinerary and broadcast times, visit our Apostolic Journey page HERE. Your live coverage host will be Mary Rose Bacani, who will be joined in studio by Fr. Chris Cauchi, a Maltese priest from the Archdiocese of Toronto. Through Salt + Light’s partnership with Catholic News Service, CNS journalist Carol Glatz, who is part of the Vatican Press Corps accompanying the Pope to Malta, will provide insight on the ground, while our own Vatican correspondent Alicia Ambrosio will provide commentary from Rome. Finally, Jenna Murphy will be keeping you updated online when you follow S+L’s Twitter feed or join our Facebook fan page. The latter allows you join to the conversation and share your reflections on the Pope’s progress. 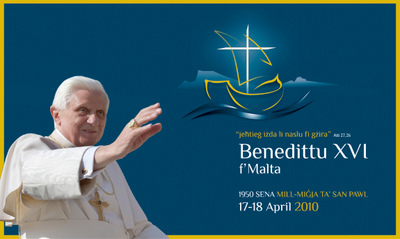 Be sure to tune in this Saturday, April 17th and Sunday April 18th, as Pope Benedict XVI journeys to Malta!